Back we go to my iTunes shuffler which played this song about an hour ago and it's still in my head in some way or another. I checked to see if there was a music video, and here it is - that's what I like to see, something for me to review. The song is an undeniably catchy country song with meaningful lyrics throughout, painting a picture for every single listener. As for the music video, I am certainly less impressed in every way. 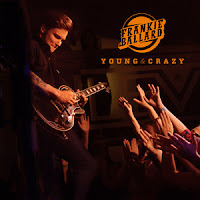 Watch Frankie Ballard perform his song on stage to his fans, showing off his performance skills whilst we see some backstage intercut scenes in this music video for "Young & Crazy". Frankie Ballard launched into the music industry scene when he took part in Kenny Chesney's Next Big Star competition, which he won; he then went on to open shows for Kenny Chesney in Michigan, and it wasn't long until his music career kicked off. He's done really well on the US Billboard Hot Country and Country Airplay charts as well as in Canada too. This song did really well, proving to many people that he deserves to be in the music industry. His voice is country perfection and I hope that he has a worldwide hit, that's all it takes. This song was written by Rhett Akins, Ashley Gorley, and Shane McAnally. Directed by Glen Rose, this music video really doesn't have a lot to it and is more of a tour video than anything else. The main visual is of Frankie Ballard and his backing band performing on stage. He's full of life, and it truly is great to see him connect with this song and release his energy out to the crowd. His fans are clearly loving every minute of it, and to be fair I would be too if I had been there. The thing is the camera operator annoys me throughout. First off the camera isn't the best, so therefore not easily transcending to the viewers at home very well. Secondly, it could've been edited lighting wise to interest the audience. But, my main problem is that it's moving about way too much. As for the intercut scenes, is there any need for them? Frankie Ballard certainly isn't acting young and crazy during these parts - if only he was. Overall, the viewers at home don't get much from this music video apart from understanding the energy that Frankie Ballard has when he's on stage - he's definitely someone I would love to see live; however, as a whole, it just doesn't work and with a song as powerful, emotional, and meaningful as this, you would think there would be a better concept.